Space and Silence to let the Arctic free your Senses. Open your eyes to our natural arctic lifestyle. How does the midnight sun taste? The Northern Light, dancing on the sky – how does it feel on your skin? What is the scent of a fluffy snowfall in December? How does the forest sound a spring day in May when all the birds have just returned? Middag på beställning, frukost 07:00 - 0900h, Välkommen! Come along, let us show you the way to the natural Arctic Lifestyle. Maybe you think of wildlife and wild nature. We think about ... the feeling. We want to share that with you. A white and quiet winter walk with snow shoes under snowy trees, in a world that seems to be made of cotton. Standing in a foaming white water long after midnight, with the sun glowing high in the sky, the fly reel in hand and lines that meditatively wander back and forth, farther and farther out into the stream. Or sitting around the campfire, with both old and new friends — all the stories that never want to be silenced. 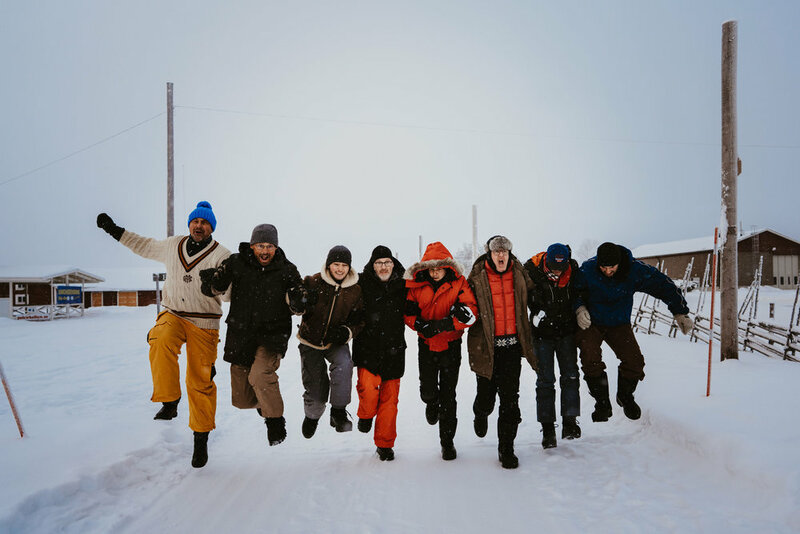 That jump we took over the Arctic Circle. Or when we swam across the Torne River and landed in Finland. Your heart is where you feel at home, your safe base to land softly and enjoy all our Arctic experiences. Whether you choose to be part of the history in our ÖvertorneåHotel Prästgården, bring your own accommodation to the campsite at the beach or stay comfortably in one of our cottages with the view over the island, there is one common denominator — our most important offer: surrounded by water, forest and sky, with the wild Torne River, Finland as the nearest neighbour and closeness to the Arctic Nature. All these lives lived here, all the people who trampled the floorboards and filled the house with generations of faith, hope and love, vigil, happiness and curiosity. Move in and let the old house from 1852 tell its story. Listen, feel and experience. Here you stay in carefully renovated double rooms on the second floor of the old Prästgården, a cultural heritage in the heart of the Torne valley. 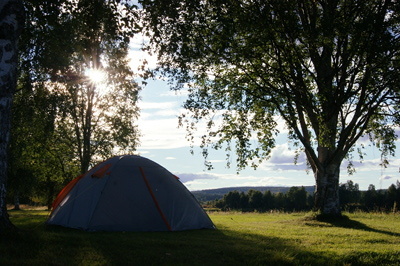 Stay close to nature and the elements, just a stone's throw from Torne River. And nearby Finland is just there on the other side of the water. In our simple and comfortable cabins there is plenty of room for just being, with your loved ones — and with yourself. For those seeking accommodation with a little extra, without sacrificing proximity to nature. 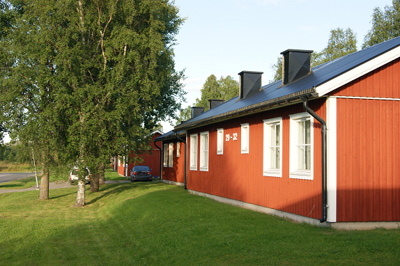 Our hotel cabin is close to the Prästgården and houses four double rooms. Feel good in the lounge with space for hanging out and sharing stories with old friends. Or why not share the tranquility and silence with new acquaintances. In the hotel cabin, steam showers and sauna offers true well-being. Just as we like it in Tornedalen. Bring your own accommodation. We offer beautiful views in the middle of nature — with vast horizons, blue skies, green surroundings and the foaming rich Torne River right outside the window. Here the natural way of life is for real. Mmm ... the lovely smell of freshly prepared food after a full day out in the wild. There's nothing better than getting to digest new impressions and experiences over a good meal with loved ones. Welcome to the table at Norrsken Lodge! preorder dinner, please. we are happy to recommend a menue. Midnight Sun on the plate and Northern lights in the glass? 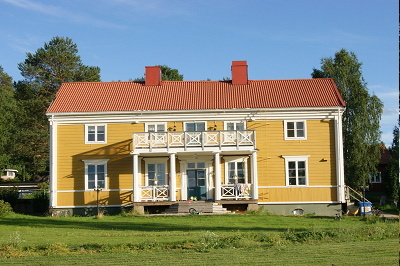 Max and Yasmine Hensler moved from Switzerland to Övertorneå in Swedish Lapland. They are warm and welcoming hosts – offering a personal and genuine atmosphere at a facility located in the very heart of The Arctic.